Twitter may be a household name, but it remains a mystery to many people. Perhaps even most people. This week I'm going to put on my teacher's cap and show you how to set up a Twitter account, how to put that account to good use (you can even use it to enter contests and win prizes), and how to read your incoming "tweets" (messages) from just about anywhere. What the heck is Twitter? In a nutshell, it's a messaging service, a way for one person (or organization) to communicate with others in 140-character blasts. What do you do with Twitter? If you're feeling narcissistic, you can send out messages of your own, on whatever subject you like, to anyone who chooses to "follow" you (i.e. subscribe to your Twitter feed in order to read your message). At the same time, you can "follow" others (friends, family members, Shaquille O'Neal) and read what's on their minds. Open your Web browser and head to twitter.com. Click Create my account and you're good to go. You're now an official member of the, er, Twitterverse. Let's find something interesting for you to follow. Click Find People, type pcworld, and then click Search. Our Twitter feed should be the first result that appears. Mouse over the accompanying icon of the little person and click it to follow PCWorld. (Don't worry, this isn't a permanent marriage. You can always "unfollow" us later if you want.) Now click Home and you'll see all the latest tweets from PCWorld's editorial staff. When it comes to Twitter, I prefer to be a consumer, not a producer. In other words, I know no one cares what I had for breakfast, so I don't bother to tweet about it. 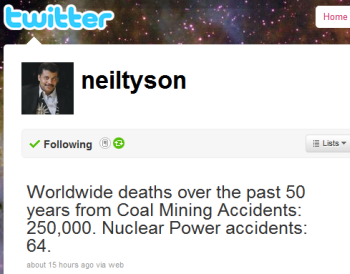 However, I do care what famed astrophysicist Neil deGrasse Tyson (@neiltyson) has to say, because it's usually interesting and educational. So he's among the select few Twitter users I follow. And therein lies my point: Twitter can actually be a fun, informative, and even practical tool--provided you follow the right people. Here are my three favorite uses for the service. Find deals. Love bargain hunting? Twitter takes the actual hunting out of the equation, instead dropping deals right in your lap. It's just a matter of following the right sites and bloggers. Here are a few to get you started: @cheapskateblog (mine! ), @FreeStuffUS, @dealsplus, and @bargainbabe. Keep tabs on celebrities. Call me star-struck, but I think it's cool to get messages from the likes of Aziz Ansari, Jimmy Fallon, Paul Feig, and my personal music hero, Brendan Benson. Makes me feel like we're buds. If there's an actor, comedian, musician, or other famous person you admire, head to Twitter, click Find People, and then follow that person. It's fun! Manage a group. As the coach of my daughter's soccer team, I need a quick and easy way to contact all the parents in case of scheduling changes, rained-out games, and the like. By getting everyone to "follow" me (and receive my tweets via text message), it's a snap to communicate with the group. Now let's look at ways you can access Twitter without being tied to your PC. For starters, if you have a mobile phone (doesn't have to be anything fancy like a Droid or iPhone), you can take advantage of Twitter's SMS features to send and receive tweets. Open Twitter in your Web browser, click Settings, and then click Mobile. Follow the instructions to pair your phone with your Twitter account. With that done, any text message you send to 40404 becomes a tweet. You can also elect to receive tweets via SMS from selected people you follow. However, because standard messaging rates apply, high-volume tweeters could end up costing you. Also, frequent SMS interruptions can prove annoying. My advice is to receive SMS tweets only from important, news-bearing sources. A better bet all the way around is to find a Twitter app for your phone--assuming your phone runs apps, that is. They're available for all the major platforms: Android, BlackBerry, iPhone, WebOS, Windows Mobile, and so on.These apps let you tweet, retweet, send direct messages, view your feeds, and so on. Many of them are free; others cost a couple bucks. 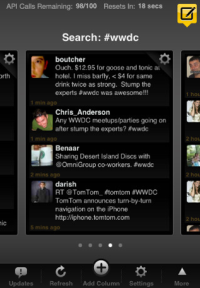 If you're wondering, I'm partial to TweetDeck for iPhone (pictured here). Rick Broida writes the PCWorld Hassle-Free PC blog . Sign up to have Rick's newsletter e-mailed to you each week .